UDM Downloads > Recite German Words! Language learning can be hard work. You need to study hard and practice a lot! However, the right tools, such as our new Recite German words, it can make learning German easier and a lot of FUN too! 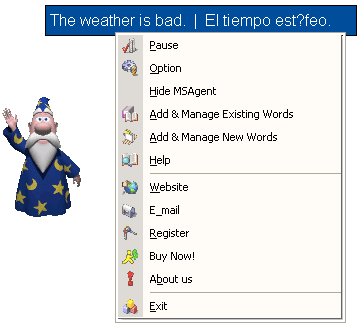 Our software will help you learn German. Recite German words is specially developed for people who are increase German vocabulary. It provide 44 categories including 2945 classical and practical words for the user to study. you can make settings by yourself for your study aims. And it can be played automatically on the top of the computer screen, so when you work, study and play on the computer , you can master all kinds of German words to increase Your German vocabulary unconsciously, easily. It is not a traditional and boring way to study, what's more, you can take full advantage of your time to improve study efficiency. This software holds lots of convenience and flexible function settings. By using the function settings reasonably, You can easy to learn German or learn English. Dictionary, it has 9000 words of basic vocabulary for you to check up the strange words you meet in your study or work. Having that in mind we have designed a vocabulary study software that perfectly suits virtually any language learners' needs. Learn any German words, expressions, idioms, phrases, etc. easily.